My first rehearsal as a member of the Spinspiration Hoop Troupe was on Saturday and we worked a lot on character development. I learned a lot about movement, breathing, and developing my own hooping persona. I’m not going to reveal a lot about her right now, but I love what she is becoming. Our first performance is going to be April 5th, 2014 during the half-time show Lancaster Dutchland Derby Rollers, our local roller derby organization. CLICK HERE FOR TICKET DETAILS. I recommend getting VIP seating as that is right where our performance space is. You’ll still be able to see well from the general admission area near the VIP seating, too. 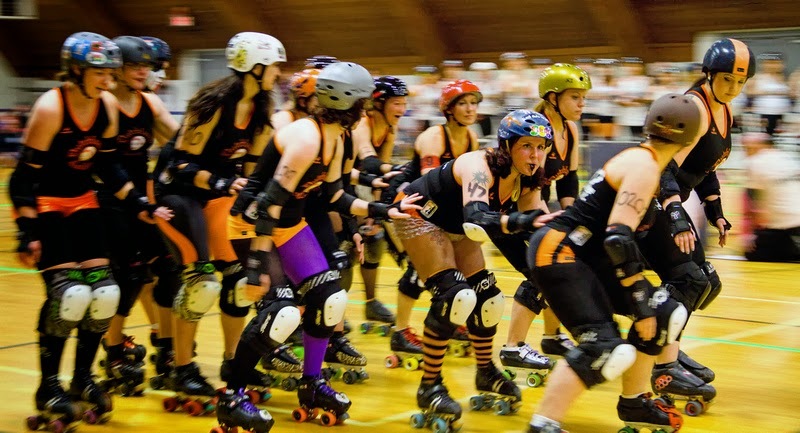 Roller derby is a great sport, and I had the pleasure of attending my first bout on Saturday, too. Jenny and I went to check out the space where we are going to be performing. I took my camera to get a feel for the place, and got some shots of the action. See more here if you are interested in taking a look at the rest of my photos, check them out here.